Obsessively Stitching: Angry Birds -- Plush! This is my Top Secret Christmas Project! My boys (husband included, but especially the boys!) are obsessed with the game Angry Birds. They like the game, but they really like to play a real life version they invented, where they chuck objects at each other. (Don't worry! They use safe projectiles for this!) 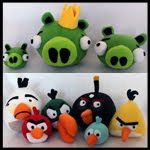 I want to make their game a little more fun for them, so I am creating some Angry Birds and pigs for them to play with! Again, this is a secret, so it has not been easy to put together a tutorial. I would wait until after Christmas, but... Maybe you want to add them to your secret project list, too? Update: I now have patterns for the Pig and little blue bird, and for the yellow bird! And now also the green bird, white bird, black bomb bird, and baby pig! STEP ONE: Cut out 4 body pieces (in the file it has a face drawn on it) in red, a rectangle of white approximately the same size as the red pieces (shown above), a 2"x3" rectangle of black, one of each of the beak patterns in orange, and some scraps to use for creating the feathers for the top of his head. The pattern piece on top of the white and red is the belly of the bird. NOTE: You want the stretchiest direction of the fleece to go left-to-right! STEP TWO: Cut out the white belly portion of the pattern so you can mark where it goes on the one red panel that will have all his features. On the wrong side of the panel, mark the line. I used chalk, but you could also use pencil or a "disappering ink" marker. STEP THREE: Layer the panel on top of your white rectangle. BOTH LAYERS should be right side DOWN -- with the marked line showing on top. Sew directly on the line. I used my free-motion foot for this, for speed's sake and to avoid having to lift the presser foot and turn the fabric. STEP FOUR: "Draw" on the eyes -- still working from the wrong side! Working from the back will make it easy for you to see your previous stitching lines and place the features accordingly. Again, I used my free-motion foot, but you could do this with a regular foot. STEP FIVE: Trim away the excess white fleece to reveal your bird's eyes and white belly. STEP SIX: Layer your black rectangle over the top of your bird's eyes. Be sure there is sufficient area to create his pupils and eyebrows. STEP SEVEN: Flip it over and "draw" sew his pupils and eyebrows! He's looking ticked off now! STEP EIGHT: Trim the lower half of your white fleece to match the red, then trim away the excess red, as shown. STEP NINE: Trim away the excess black fleece to reveal his eyebrows and pupils. Hee hee! I love it! STEP TEN: Create the feathers for the top of his head. REMEMBER: The lines on the feather pattern piece are your SEWING lines, and NOT your cutting lines! I used some small scraps of red fleece and free-motion sewed directly around the pattern piece. Cut around your sewn lines, remembering to clip almost all the way to your sewing line between the feathers, and turn it right side out. STEP ELEVEN: Layer one of your red panels directly on top of your bird's face, right sides together. Sew down the right hand side of the pieces, using a 3/8" seam allowance. Repeat for the other two panels. Your bird is now put together in two halves. STEP TWELVE: Center your feather piece over the seam on the "face" half of your bird, raw edges together, with the bigger feather on the left, and pin it in place. Start sewing a few inches behind the matched seams (so the opening for stuffing will be on the back of the bird, not right by his face), and sew almost all the way around, leaving a few inches for turning and stuffing. STEP FOURTEEN: The beak! Match your two beak pieces together on one edge, with the smaller piece on top, and sew with 1/4" seam allowance. Stop with the needle DOWN, 1/4" before the point of the beak. Lift your presser foot, turn the beak, and shift the smaller beak piece over until the sides match, as shown. Lower your presser foot and continue sewing to the end. Turn the beak right side out and stuff it. STEP FIFTEEN: Sew on the beak! If you like, you can use four pins to hold the beak in place after you line it up the way you like it. The smaller portion of the beak is the bottom, and the larger portion is the top. Turn the edges of the beak under as you go, and sew the beak in place. I like to match up the seam of the beak to the line where his white tummy starts. The red angry birds do have a little black tail, which I chose to omit. If yours must have a tail, you can certainly sew a little tail using the same method as the head feathers, and attach it the same way as the beak. I suppose I may go back and add tails to mine! Ta-Da!! They are so very angry -- and CUTE! Here are a couple of my red birds with a little blue one. I do plan on making all the different "breeds." The method is the same, with slightly different facial features. Of course there are some egg-shaped birds, and that pyramid-shaped yellow bird -- which will require a different basic pattern. But they are in the works! If anyone is interested in patterns for the other birds -- or the PIGS, which I am in the middle of creating -- let me know! My boys love that game too!! This is totally on my list now. Thanks!!! Love, love, love! Thank you so much for sharing this pattern. I am so making this for my kid. He also loves the black bomb-bird and I would love to make that too. Ok, my to do list just became alittle bit longer.... Love this! Thanks for sharing! these are the cutest things ever. And if I had better sewing skills - I would attempt them. Also wanted to let you know - I refer to your 1st quilt ever tutorial like 20 times a week. I'm so glad you shared this!! My husband loves that game and mentioned that they are starting to sell angry bird stuffed animals, but they don't come out until February or something and I'm sure they're expensive. Now I'll just have to make time to do this before Christmas! I would love to see a pig tutorial if you can get one put together! THANK YOU!!! MY husband, brother-in-law, and brother are getting these in their stockings! YOU ROCK!! Well, I feel silly.. what's angry birds? I LOVE them nonetheless... super cute. Love this! My husband loves the game, so it would be fun to have these in the house. I would love patterns for any of the different characters you create! Thank you for sharing this. This is AWESOME!!!! Of course we need the other bird and pig patterns! Thank you so much for sharing. Our whole family loves angry birds. Oh ... I do not know that game but the birds look really really cute!!! Amazing! So funny! My husband and I just got addicted to that game. Thanks for sharing. 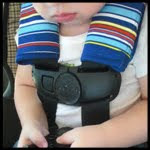 perfect stuffer for my hubby and kids! oh my goodness! These are adorable!! My family is also obsessed with this game as is everyone on my team at the office! LOL! Great tutorial. Thank you! Oh my gosh, these are fantastic!! I think they will be the hit (pun intended) of Christmas morning! You're an awesome Mom! Just when I thought I had the Christmas sewing under control you come out with this...LOVE IT! My boys and husband are huge Angry Birds fans...and have you played the new Angry Birds Seasons? I would love to see your other patterns - please don't be shy! OMG!! I LOVE that game! I..Must..Make..These! I love it! I know several grown boys who would love these too! Thanks for the tutorial. How fabulous! My 4 year old is hooked on that game. Every time we go to my parents she wants to play Angry Birds on my mom's ipad. 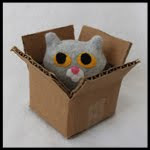 I might just need to make one of these for her for Christmas. LOVE! LOVE! LOVE! My boys (including the hubs) would be all over this! Great tutorial! Awesome! My 4 year old- and hubby love angry birds, and I wasn't paying 14.99 for the plush! Now, to see if I can get my hands on the fleece before Christmas. K, these are so much fun!!!! Cute! What game is this? It sounds spectacular! These are wicked cool! Thanks for the great idea! This is great!!! Love IT!!! Oh wow! I might have to make some of those. Do you have an Etsy? I'd love to skip the sewing project and buy them from you if your price is within my range...or trade something with you from my shop. I made one last night.. a blue one (because it was the only felt I had that would make a good bird). I do not have an iphone so I've never seen the game. I just like the idea of an angry bird. Needless to say, my daughter took the one I made I have orders to make them for Christmas gifts for the hubby's friends who all play. Its an instant hit! this is amazing and i can't wait to try to make one (or two - my dad and i are obsessed). i'm going to the fabric store today! I think I have just found what i am making my husband for Christmas. Thanks! I am ashamed to say I've never heard of Angry Birds. They're cute though! You are my hero today! I am so going to make one of these for my husband. How do I keep it a secret? I want to show him the post right now! Must.go.buy.fleece.!!! Thank you! I am so making that for my 24 year old son. I just got home from JoAnns! Let the sewing begin! My husband and his co workers have an ongoing score card of this game at work! He definitely needs real angry birds to put on his desk. Thanks so much! Wow, you captured him perfectly! I love that game and I love your tute! Thanks so much, I'll be spreading the word. Love them. Husband, son and I just became addicted to this game over the weekend on my iPod Touch. These are awesome! I too would be willing to skip the sewing and buy them from you if you have Etsy! But I would love the patterns to add to my stack. I seriously need to stop my real job and do some sewing for Christmas gifts. I just started playing this game this past week and I am so hooked! When I saw this I about died! They are so cute!! I have to save this for a later date though because I just don't have enough hours in the day to get half of the things done on my to do list as it is! But hopefully in the next month I will be making some of these too! Thanks so much for the tutorial! I would love them for the other birds and pigs too! Thank you! LOVE this!! This is a perfect gift idea for my husband and/or son! Can't decide which one would love it more. I would love if you shared the patterns for the other birds and the pigs, too! you rock! thanks for the tutorial and what a perfect idea. My 5 year old son is obsessed with this game. Thanks so much for the tutorial! I hope I have enough time to get to this before Christmas. It would be so cute in his stocking! Did you hear the little shriek of joy when I saw this??? Your birds look so great! I can practically hear them careening into the structures. My boyfriend & I are both completely addicted to this game and I would love to make some of these for him. (okay for me). Thank you so much for sharing this! Awesome looking birds! Too bad I don't own a sewing machine, so maybe I'll have a go at doing this by hand. Thank you!!! My husband and 4 kids will love theses and your ornaments, hope mine come out okay! Okay there was no way to hide me making these from my husband so when I told him he said I need to make the other birds too, do you have the patterns for them on the computer yet? Thanks! My husband plays this ALL the time and he just showed me the plush toys that are coming out next month...$14.99! His favorite is the yellow bird...could you possibly share the pattern with me? I must say I am partial to the pigs...ha So cute! obviously i love this because i play all the time (now playing seasons!) ... i have a quick question. i've got a million projects on hand right now - so don't feel like going to the fabric store. how about felt - that should be good too - or good enough? It depends on how "heavily" they will be played with. Felt will pill over time, and the cheap craft felt isn't very sturdy -- it tends to stretch and distort, and also tends to be quite thin. If these little guys are going to be chucked around a lot, I highly recommend going with fleece -- but if they're not, give the felt a try! Let me know how it turns out! Wow! this is a "must try" on my list! Oh I LOVE this! And I am so addicted to that silly game. Like "stay up too late at night and not get enough sleep" addicted. I must make these birds! Thanks for the tutorial! We just had our xmas party with our close friends, these would have been a hit with the xmas exchange. They are on my list for next year! Husband wants one to sit on his desk at work just to throw when he gets frustrated! Great job! i'm just going to say it ... there is no shame in gluing - especially the pupils. maybe the eyebrows. even the eyes, if it comes to it. Thank you So much for posting this...my husband loves this game too! I've made him one and now my kids have put in 'orders'. Would love to see the pigs or anything else you come up with! *LOL* Love, love, love this! Hilarious! And so cute! Showed to the DH and he loved as well. Wish I had the time do this -- we would love it!! I am absolutely addicted to this game and I know one of my coworkers is too. I also managed to snag his name in the secret santa here at work, so this would make a PERFECT gift for him. Thanks so much for posting this! i would love the pig pattern!! OMG...my husband LOVES Angry Birds but I can't sew on a button, much less do this! SO JEALOUS! I've been addicted to this game forever & my husband and I are expecting baby #1 in July - we are decorating the room in Angry Birds! going to have to make these :) TFS!! Please tell me you're planning on posting your other angry bird tutorials!? I love this one! I'm interested in the other patterns! My 5yo son and myself and my husband (in that order) are pretty into angry birds. Our daughters, not as much. But I worry about the amount of iPad time my son is getting. So this week I suggested he use his blocks to build forts for the piggies to hide in. Success! Only we don't have any green piggies laying around. Christmas ain't Christmas unless I'm up past midnight working on something! I LOVE this angry bird plush! YOU are AWESOME! Thank you. My husband has this game on his cell phone and loves it. I know what I am going to try to sneak in before Christmas. 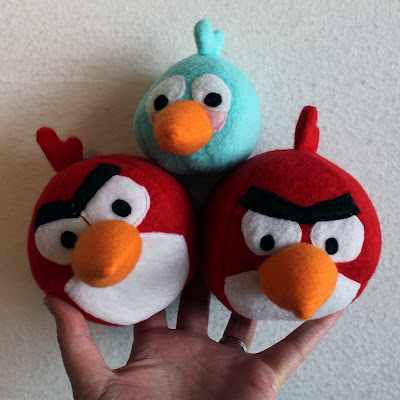 My friend is crazy for these birds and I will suprise this Xmas with a self-made angry bird! I have to make one of these for my husband! It is SO funny that I found your post! 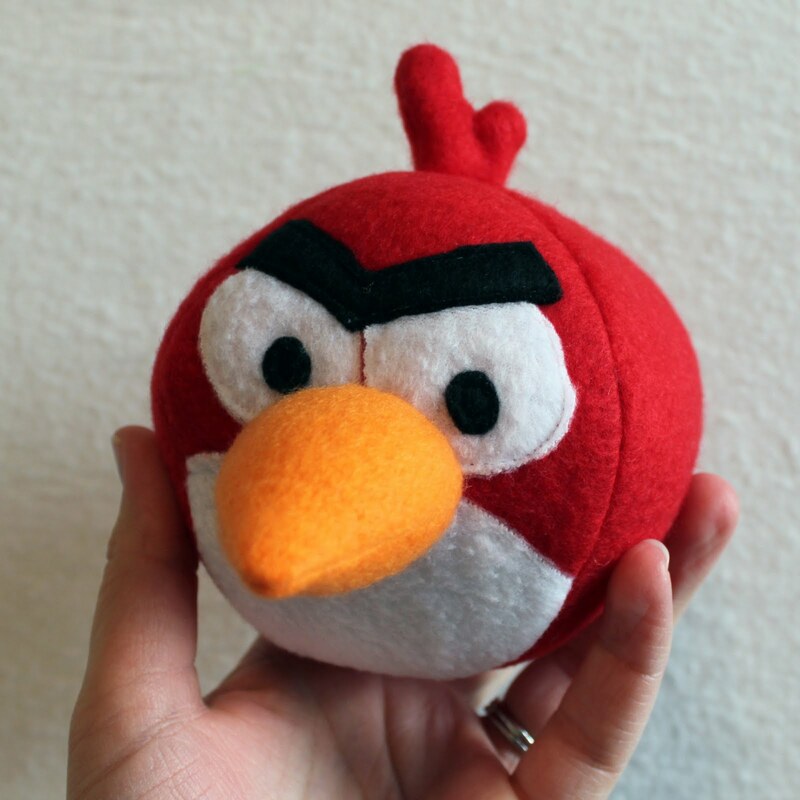 My husband JUST suggested to me the other day that I make a plush Angry Bird for my brother for Christmas! Your pattern is great! My red bird turned out so cute and went together so quickly. Thank you so much! I am loving your angry bird toys, but I have to admit, I have no idea what Angry Bird is! Is it a computer game?? Thank you, trying to come up with a crocheted or a knit version of these at least it gives me somewhat of an idea on how to do them. These are adorable -- love that game! Wow thats awesome. I think I'll be making that for my husbands birthday! so cute! I recently got addicted to this game. Great job, Care! You are a master!!!!!!! I am passing your blog on to a friend at work. OMG!!!!! This is sooo awesome! My kids (7 & 11) really love this game, as well as my nephews (5 & 7). I'm gonna have to make some for all of them (or maybe a really large bunch so they can all play when they are here together at the house. I just finished another personalized pillow for my niece this past weekend and will post soon. These are so cute! My almost 5 year old loves to play this, and would LOVE to play a real version of it. He also loves stuffed animals. I am going to have to make these for his birthday! I really want to make the whole set - thanks so much for the excellent instruction! Just finished red bird and posted a picture to your flickr group. My boys are so excited for me to whip up the rest of the angry birds! Thanks so much for posting the directions! And I have been lurking your blog for the last few days and I LOVE your creativity and sense of humor! These really are excellent, though! I've been having problems with my file hosting site, and am currently in the market for a new one. Please don't give up! :o) Send me an email, would you? Hi, these are fantastic, I can't wait to try one! I recently finished 3 angry birds costumes for some friends going to a fesitval. If you'd like to have a look at the finished products i'd love some feedback! The timing on this one was impeccable. My son lost his puffle yesterday and this was just the thing to cheer him up until we can get a new one. He's enjoying his new friend as I write this. That's Awesome! My brother's birthday is coming up, he'll LOVE this! Thanks for this tutorial! I made three of the red ones and am going to whip up a couple of the pigs too for my brother's bday gift! When I saw this I laughed (loudly) and knew I HAD to make these!! So cute and pretty easy too!! Thanks! I used your angry bird pattern to make my Prototype Moogle. :) Thanks, you saved me a lot of work making a pattern. Wonderful! I have just recently started playing the game myself but i love it! Supercute wonderful plushies you have done! I have a question... I do not have facebook (and I am one of "those persons" that do not wish to join. Is there some other way for me to get all the patterns? 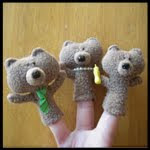 I would love to sew these little fellows! Thanks in advance! I am so excited!! My two almost three yr. old loves this game. And now I have this birthday all planned!! Angry birds party here we come!!! Thanks so much for this tutorial!!! Thanks for the patterns and the tutorial. Althought I have no sewing machine I made my own version of the bird by hand! Great tutorial, thanks a lot. I have just post some photos to your flickr group! Thanks!! Thank you so much for the awesome Angry Bird tutorials! I made Red Bird for my son today. I'm as thrilled as he is with how it turned out. So fun! I just made the red angry bird for my son. He absolutely loves it! I used the furry red fleece. It was a little more difficult to work with than regular fleece, but I loved how it gave it more of a feathery look to the body. My son has been throwing him around all day. :) Thank you so much for the tutorial! These are so expensive in stores and now I can make them for next to nothing! THANK YOU! Thank you for the fantastic set of patterns, I just cant stop making them and my kids love them. Even made a set in pinks and purple for my little girl. Check out photos on my blog. You are a amazing and kind beyond words to share these with us. My plan is to make these as bean bags. Or maybe just some with a little weight on them. And then add some blocks and various other pig fortress materials so my little guy can play Angry Birds in real life. You are brilliant! I am so happy to find your patterns. I am going to make these for my brothers and brothers in law. So so cute! This is awesome! My boys are totally getting these for Christmas! thank you SO much for the awesome tutorial. You did a great job with it! I'm making these for my grandsons for Christmas and am also giving them a basic block set to make pig hideaways! I wrote my blog spot about these today with a link back to you. Thank you again! Oh, I'm with everyone else--great idea! Thanks for the tutorial. I did go to buy fleece, as I didn't have anything solid-colored at my house. I'm not going to tell you how much fleece I bought (your fault! ), but I will pass on that both the Anti-pill and the blizzard fleece solids are on sale at Joann Fabrics for $4 a yard, which is less than half price. I believe it's through the end of Thanksgiving weekend. I love this idea. We are making them for all the cousins. My blog post has some finished pictures. Gotta go set up some towers to Knock down. I would love to have a pattern to the other birds you are making, Please!!! Fabulous! Thanks so much for sharing your patterns. My machine has the ability to adjust the foot pressure. Since I don't have a free-motion foot, I put the pressure to "0" and removed the foot altogether, just using the foot-clip-thingy (WHAT do you call that, anyway?!!) 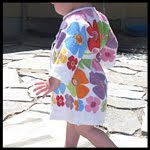 without a foot attached, and small stitches to easily control the direction of the sewing. With the thick fleece, I still had to lift and readjust occasionally, but it was much better than otherwise. Just thought I'd share. Thank you SO MUCH for this tutorial--I was delighted to find a link to it on Craftsy so I wouldn't have to make it from scratch myself. My son is going to LOVE these!! Thanks for sharing, it's a very good tutorial. I made the red bird last night for my son and it came out great! He loves it! Thank you so much for the tutorials! I will try the pigs next! Thanks for these tutorials. I made them as gifts for some visiting children & they were so excited about them. These are SO cute! I especially love the photos--I know they're in the order of sewing but it was fun to see the face emerging bit by bit. Will definitely have to make these! So Cute! When I got a new phone last week, it came with Angry Birds. Sometimes I cannot pull the kids away! It is so addicting...not that I know! ;) My four-year-old's birthday is coming up, so I am going to try my hand at these. I just know they will make the perfect gift! Thank You! HOLA,FELICIDADES POR TU BLOG, ES MUY LINDO. ME FACINO EL QUIET BOOK PARA MIS NIETOS Y ME ENCANTO EL PSP DE LOS ANGRY BIRDS, LO MUESTRAS TAN BIEN Y DE UNA FORMA TAN SENCILLA DE REALIZAR QUE ME ENCANTARÍA HACERLOS PARA MIS HIJOS Y NIETOS. I loved all of these so much that it was the starting point for my son's birthday party! We had a kid-sized version of Angry Birds for the kids to play. Mine did not turn out as nice as yours(I'm not much of a seamstress) but hop on over and take a look. Loved the patterns! Do you have one for Angry Birds Mighty Eagle? So cute! My son LOVES those silly birds. There's still enough time to whip up a set before the holidays! I made my first Red Angry Bird today I hand sewed the whole thing and it didn't turn out to bad. Thank you so much for the time you took to create the patterns I love them all and will be making the rest of them soon. Thank you so much for these amazing patterns and tutorial. I just made these for a birthday gift and they turned out gorgeous!!! big hit!!! Thank you for sharing!!! Thanks so much for this tutorial! My nephew is obsessed with Angry Birds and I made him 4 birds & 3 pigs for Christmas 2010. Let's just say, I beat Santa! His red bird quickly became his "can't sleep without it" toy and after two years is still going strong even after all the washes. I know this tute is rater old by now, but i World just like to thank you. My sono to be 5-years-old boy just fell in love with these crazy angry birds. 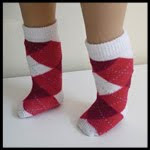 I just sent shopping for fleece, cannot wait to give him these for his birthday! Thanks a lot. Hi - By any chance have you done a Pink Bird? She is soooo cute. I know you have boys - its just that she is part of the gang and I figured if you did white bird than pink bird would be in the same category? It seems scribd removed the pattern, haven't checked the others. Was going to work on some for my 6yo birthday. Anywhere I can download? Thanks! I would love the patterns as well for the angry birds and pigs patterns. The link is no longer working in the tutorial. I would LOVE the pattern for the red angry bird? The link isn't there anymore. Play now to game johnny upgrade unblocked and circloo 2 cool math.